Perfect!! 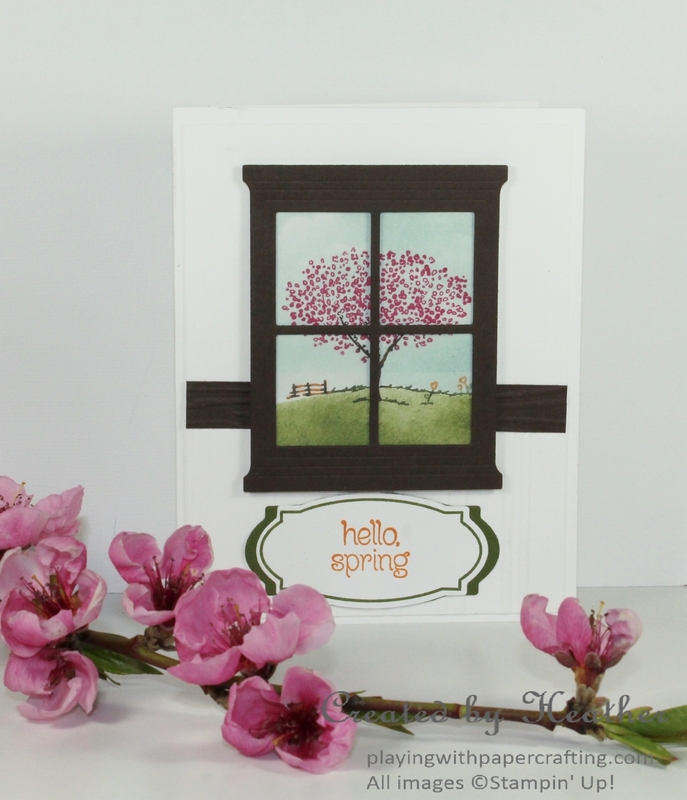 Sky, grass, blossoms and flowers - great for a scene viewed through a window. 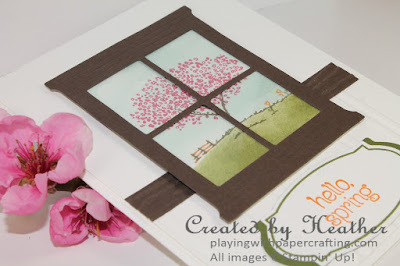 The idea behind this card is that you're in a house, looking outside through a window at a spring tree in full bloom. I sponged the sky and grass areas in Soft Sky and Mossy Meadow ink, using a bit of a mask for clean transistions between the two. Without realizing it until I put up the window frame, the tree was right smack in the middle where the center piece of the window frame lies. If I had tried ahead of time, I might have moved the tree slightly to the left of center so more of the trunk could be seen. 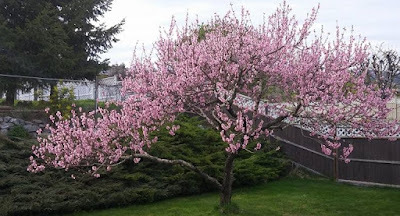 I used a Melon Mambo Stampin' Write Marker for the blossoms on the tree, Pumpkin Pie for the bench and the flowers on the ground and Early Espresso as a neutral on the trunk. I made the beadboard embossing using the Stylish Stripes Embossing folder and turning my small piece of Whisper White in it until the stripes were vertical, not on the diagonal. The sentiment is from the Circle of Spring stamp set and it fit within the cool stamp and coordinated label die cut from the Rose Wonder Bundle. I cut another label die cut in Mossy Meadow in half and added it to the back of the sentiment, extending each side beyond the edge just slightly. 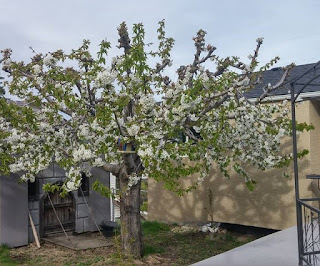 Our nectarine tree above and our cherry tree on the right, gearing up for another bumper crop!! Quick and Cute with You've Got This! You're the Apple of My Eye Thank You Cards!